What makes a community flourish? It’s a subjective question, and the answer depends on what each community needs. 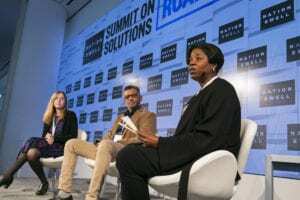 But even weighing the many variables from city to city, a few universal themes emerged at the NationSwell Summit Roadmap to the Future, a recent gathering of civic leaders who had assembled to share proven solutions. These tactical and practical insights could help to build inclusive and forward-thinking communities that respond to residents’ needs. A 16-year-old came up with the idea that led to the Running Start for Careers program, after Berry heeded his advice while visiting an industrial arts class. The program develops industry-taught elective classes in high school for which students receive school credit. Students graduate with an industry certificate — whether it’s in film, or medical sciences or lab sciences — to show potential employers. Since the program was launched, Berry said that 1,200 kids, particularly Latino boys, who were at 45 percent graduation rate, are now at 98 percent on-time graduation. Albuquerque mayor Richard Berry, center. Photo credit: Adam Schultz for NationSwell. The program, called There’s a Better Way, was piloted with $50,000, and is now being scaled and replicated around the city. Since 2015, 4,000 day jobs have been offered; more than 400 people have been connected with employment services; nearly 700 city blocks have been cleaned; and nearly 200,000 pounds of litter has been removed. During Berry’s tenure, Albuquerque was voted the second Best Run City in the nation with a population of more than 500,000. To mayors and city leaders, he says: “Listen with intention, and don’t underestimate the power of pilot projects. Your community will support you. Lower the barrier of risk for your community and they’ll let you do what you need,” he said. In Los Angeles, FUSE fellow Aparna Mukherjee is working to create a model for inclusive civic engagement, soliciting community input to ensure that Angelinos’ voices are represented in decision-making and policy. Cities are racially and economically isolated, King said, and many Latino and black students go to schools that have far fewer resources than their wealthier neighbors. These students are following the rules, and still not succeeding. Panelists Brittany Packnett, left, and John King, center. Photo credit: Adam Schultz for NationSwell. Part of the solution is building a common lexicon. 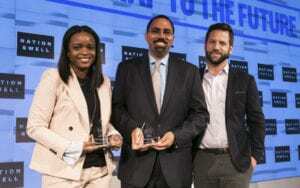 Understanding the difference between the words diversity, inclusion, equity and equality are imperative, said Brittany Packnett, Vice President of National Community Alliances for Teach for America and co-founder of Campaign Zero, a police reform initiative. So what are the calls to action? In Stockton, Calif., where nearly 40 percent of students are considered “ethnically diverse,” and only 19 percent of third-graders are at reading level, FUSE fellow Jason Weiner is working to connect at-risk kids to higher education opportunities and reconceive how young people are educated from cradle to career. America, as a population, is getting older. The number of people age 65 and over grew from 35 million in 2000 to 49.2 million in 2016, according to the US Census Bureau. That’s 15.2 percent of the total population. Considering these staggering numbers, how can we, at society level and in local communities, help to make sure this population gains access to what they need, in a way that gives them a sense of independence, dignity, and value? Panelists Anu Partanen and Lux Narayan with moderator Kamili Wilson. Photo credit: Adam Schultz for NationSwell. Differences in income levels are leading to how people live as they age. Disparities in race, health, income, must be addressed when designing new systems, products, and services we all rely upon to improve our lives, he said. In Long Beach, Calif., where more than 22 percent of Long Beach’s elderly residents will be living below the poverty line by 2025, FUSE Fellow Karen Doolittle is working to improve the quality of life for senior residents by designing a coordinate system of health and social services. In towns across America’s heartland, there’s great promise for new enterprises that can and should be sprouting up fueled by risk capital, said J.D. Vance, author of the popular book Hillbilly Elegy, as he Skyped in to a session called Navigating the Land of Opportunity. And contrary to what some tech investors might believe, software isn’t the only potential growth industry. 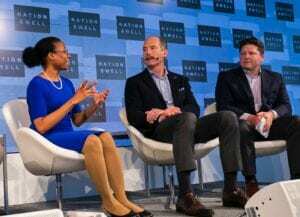 For example, in Indianapolis, Vance said, venture capitalists have invested in a company that’s working to develop cheaper and faster ways to test the water supply, responding to the pressing need in that city. “There are lots of companies that fit that model,” Vance said. “They’re built on an anchor industry that’s unique to that particular place.” Ripe opportunity for investment. In Pittsburgh, FUSE fellow Cynthia Shields is working to strengthen the pipeline of skilled workers by aligning programs and strategies; and in Philadelphia, FUSE fellow Barry Wilkins is working to provide better job opportunities for underserved populations by building partnerships with local businesses, industry organizations, educational institutions and city agencies.